Cart based discount rules with examples. So Why Cart Based Rules ? When the discounts are to be calculated in cart by checking many perspectives (Conditions) you can use cart based discount rules. As you see, many store owners wish to configure a discount scenario only in the cart. You can apply three types of discount based on on several conditions. The rules defined here will be applied in cart section (i.e.) 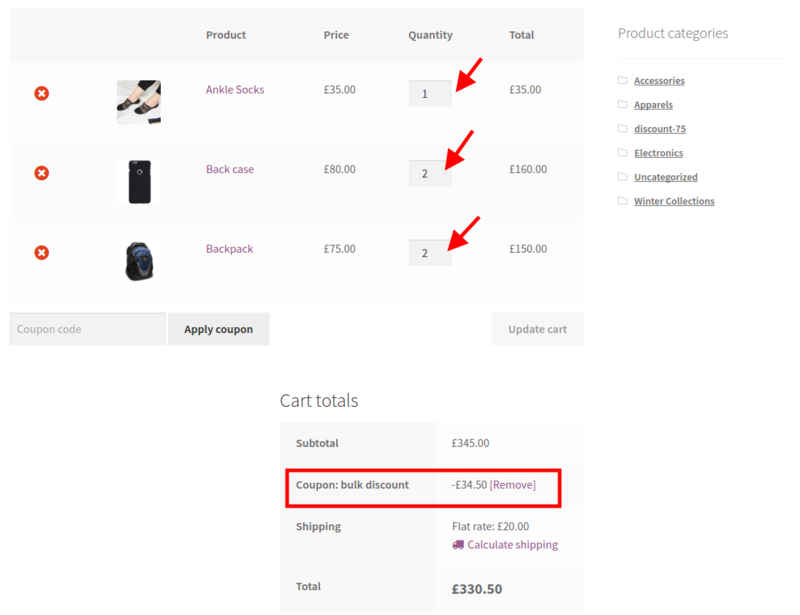 it allows you to apply discounts only inspecting the cart items a user added to it. Subtotal at least - A discount condition that applies the discount when the order subtotal is greater than or equal to the value given here. Number of line items in cart (Not quantity) at least - A discount rule that helps to apply the discount based on the number of items available in the cart. If you have the rule using this condition, then the discount coupon applies only if cart contains items greater than or equal to the value given here. Number of line items in cart (Not quantity) less than - It checks for the number of item in the cart is less than or equal to the value given here. Total number of quantities in the cart at least - It checks for the total quantities available in the cart. That is, if cart contains 2 quantities from product A and 1 quantity from product B then the total sum of quantity is 3. So if you have entered 5 here, then the discount will applied only if cart contains quantity of 5 or more. User in list - It is used to create a discount rule for specific customers or users. Shipping country in list - Discount for the customers coming from specific country will be possible with this condition. Email ends with - It helps to offer the discount for the users whose email is ended with .com, .org, .in, etc. Billing city - Discount for specific location will be possible with this condition. Free Shipping -With Cart based rules you can also enable Free Shipping as a discount to the User. Here you have to give the priority for the rules created inside Cart discount rules. That is, choose which rule is going to implement first. For example, if you are having multiple rules, those rules will be applied based on the priority you have given. Note: More than one rule should not have same priority. It should be unique. Enter the unique name for the rule. Enter two line description about the rule. Choose the dates between which the discount is valid. Choose the condition type for cart discount method. You can apply discount on following types of conditions sub-total basis, cart item count, Quantity sum, Customer Details. 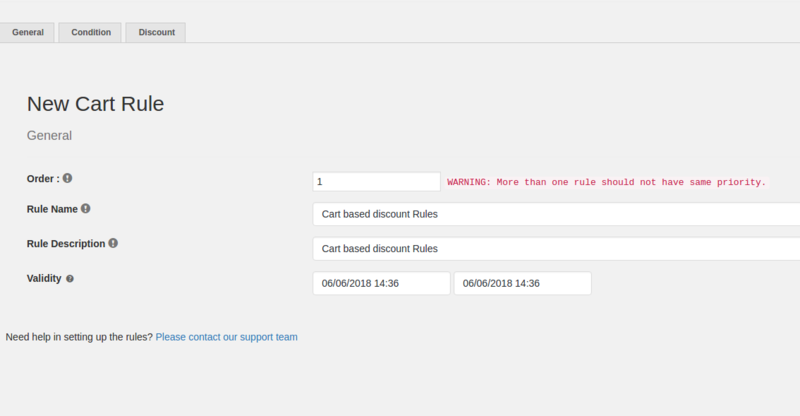 Similarly you can able to create combination of rules by adding the conditions, the added conditions will work in "AND" condition so the discounts will work only when all the conditions are satisfied by the Cart. To provide a discount when the Cart contains specific quantities of products and you can set a condition for Line items in the cart. This condition will check the number of quantities as well as the line items in the cart. Then, a 10% discount should be applied in the cart page. You can also provide a price or Free shipping as a discount. The 10% discount applied in cart when the cart has 5 quantities and 3 line items. Here are few settings which you need to check for when you have a cart based rule. You can change the Coupon name which you wanted to display in the cart page. If you have a Free shipping Discount rule(Free shipping rules), you need to enable the free shipping from the settings as well.